Last week I received my latest City of San Diego water bill; we’re billed every 2 months. Our bill has a base fee for water, base fee for sewer, a few other fixed costs and then the actual cost of water that, of course, varies based on usage. The problem that I immediately noticed is that water for Tier 1 was $3.9183 per HCF (1 HCF = 748 gallons). We used 6 HCF for a total cost of $23.51 in variable costs; the fixed costs total over $100. Just for reference, the average usage in my area is 13 HCF, so we’re doing pretty well in conserving. While I can completely understand that fixed costs handle infrastructure and personnel costs, the actual water cost doesn’t provide any incentive to conserve. One of the fixed fees is adjusted each year based on usage, but it is still fixed for the entire year. If I save 1 HCF of water every 2 months (16% reduction), I’ll reduce my bill a whopping $3.92! If on the other hand I double my usage, I’ll pay an additional $23.51 which is nothing. What I propose is that the fee structure change such that each HCF of water costs say $20 and have no fixed costs. Throw in a minimum fee that say includes 4 or 6 HCF of water and now there is incentive for people in my area to reduce usage. At the current rate structure, the average user in my area pays about $155 (I think the base sewer fee is a bit higher, but I’m not sure); under my proposed $20 per HCF, the average user would pay $260. Now, people reading are probably saying that this is outrageous to increase the water rates so much, but think about how this would encourage conservation while still covering fixed costs for infrastructure and personnel. Of course, my proposed number is simply based on taking my total bill and dividing by the number of HCF used, so it could easily be adjusted. There is probably something I’m missing here as this simple pricing change seems like it would go a long way to encouraging conservation. Today I received a survey from the congressman that serves my area, Duncan Hunter. (Notice I didn’t say my congressman, I don’t think he serves my interests.). The survey was sent to an email address that I used once to fill out a form to tell the congressman to stop sending paper newsletters. Any personally-identifying information which you choose to provide. For example your mailing address, in an electronic mail message or web form requesting information or commenting on current legislative issues. Information collected in this manner is used solely for information and, in some cases, to respond to you. Please also see Security and Policy Notices posted on individual Member, Committee and other House office web sites for information on how individual offices may use the data you choose to provide them via forms on their sites. It doesn’t say that I can be contacted for a survey, does it? Furthermore, there was no unsubscribe link in the survey. This is almost a violation of the CAN-SPAM act as the act requires a way to opt-out. However, since this wasn’t an ad, it probably doesn’t violate it. Duncan Hunter, stop sending me unsolicited paper and electronic mail. While you are trying to use technology to be in touch with your constituents, you are doing it in a way to further tick us (me) off. I’ve written before about the California hands free cell phone law and how useless it is. While studies say that hands free still distracts people (my wife says that I’m distracted when I’m just talking to her in the car), a hands free law is a start to getting people to focus on the road. On Saturday, as we were driving back from REI, we turned onto Convoy Terrace near the Air National Guard base when I saw a truck from A-Pot Rentals coming out of the base and moving in the same direction I was going. The driver was in the right lane and I was in the left lane; he was yapping on his phone and changed into my lane right where I was. Luckily there was a turn lane and no oncoming cars, so I was able to move into the turn lane and get around the driver. This driver was clearly distracted by illegally using his cell phone while driving. I called the company later that day and the person that answered didn’t seem to really care. If the driver had hit me, I’m sure the family owned company would have cared! Why can’t people just get off their phones and drive? The fines need to be increased and enforced to discourage people from violating the law. How about raising the fine to $500 for the first offense, $1000 for the second offense as well as driving over the cell phone, and $5000 for the third offense? Maybe that would get people to think twice about talking while driving. While Christmas was yesterday, I consider today the end of the holiday as it’s when I started to see Christmas trees ready for recycling. While running today, I saw a number of trees at a local drop off facility. This seems like such a waste to me; forget the environmental impact (I’ll get to that later), but if you went to the effort of finding a tree, lugging it home, putting decorations on it, and putting gifts under it, wouldn’t you at least want to keep it for a few more days? I wonder if some people took the tree down right after the gifts were removed from beneath it? Christmas trees are not as environmentally horrible as everyone thinks, because they are plantation grown for the purpose of being a Christmas tree. It’s not like they are cutting down old-growth forests to give you a Christmas tree. Is she really that clueless or did that just make for a good quote? The cutting down of the trees isn’t the only environmental impact. Consider that the trees are cut down (primarily) with chainsaws or other motorized equipment which burn fuel and contribute more greenhouse gases to the atmosphere. Then the trees are trucked from where they are grown/chopped down to Christmas tree lots which could be pretty far away. Then people drive to the lots to pick up the trees. After they’re done with the trees, people either drive to dispose of them or have them picked up (for single family houses in the city of San Diego, those with trees can leave them at the curb and they’ll be picked up with other green waste which shouldn’t cause the Environmental Services folks to have to make another trip), then motorized equipment (chippers) are used to convert the trees into mulch. So, if you think that there is little environmental impact from the trees just because they were grown specifically for the purpose of being Christmas trees, you’re clearly mistaken. to water as required by the restrictions. The water restrictions still let us fill our pool (but not overfill it). Last time I checked, it takes a lot more water to fill a pool than to water a lawn (of course, a pool should only have to be filled once a week to offset the evaporation of water). The main problem with the restrictions are basically unenforceable. Are the police (the ones the city can’t afford) going to stop fighting crime to issue citations for people watering their lawns? Who is going to remember when to water their lawns (odd numbered houses and even numbered houses water on different days). We definitely have to do something about our water shortage, but these restrictions really aren’t going to do a whole lot. Maybe the city and county should have thought about population growth in our desert before approving more housing units like they’ve done in the last few years. We’re all going to pay for the mistakes of our politicians. One of the propositions on the upcoming California ballot is about changing how the lottery works and increases advertising for the lottery. I have read the pros and cons of the proposition and no one has mentioned that lotteries are effectively a tax on those can’t afford it. (A friend of mine has called lotteries a tax on those that can’t do math.) In many cases, low income people play the lottery in the hopes that they’ll win. While there is nothing wrong with hoping, the reality is that people will keep playing the lottery despite the odds. Increasing advertising of the lottery will add a tax burden to low income people. This is probably the best reason I can think of to vote against this proposition; we don’t need increased advertising for the lottery and don’t need to encourage more people to play it. How about some real solutions instead of this hidden tax? In your article http://www3.signonsandiego.com/stories/2009/mar/20/bn20water12926/?zIndex=70189 about the mayor announcing his plans for water budgeting, he is missing an important component, the number of members of a household. The water budget is based on water usage in fiscal years 2005-07. Using this is fine as long as other variables remain the same, namely the number of people in a household. Our son was born in May 2007 and since then our water usage has increased to wash his clothes, his cloth diapers and him. While we are doing everything we can to conserve by replacing our backyard with artificial grass and removing our front lawn to replace it with drought tolerant landscaping, not everyone can afford to do that. For families that added a child or even started caring for someone else at home in the last 2 years, this water budgeting needs another variable and that is the number of people residing at a residence. Maybe the mayor and city council will consider this before voting on the plan. It probably won’t get published because I recently had a letter published, but we’ll see. I’m going to send this to the mayor as well. Following up on my previous post about the local city council election, I’ve decided to post copies of ads I received from both candidates (these ads are only the ones I received today; I receive ads a few times a week from both candidates). Please, oh please, don’t elect April Boling; we need cooperation in government and all she seems to want to do is put down her opponent. To me, this seems like someone that has no good qualities to be in government, so she slams her opponent. Any quote can be taken out of context and misconstrued. Let’s not stop there; the photo of Marti Emerald has been flipped horizontally; the original is the other way. And while I’m on a roll, that picture comes from a site that is copywritten which may make using it a copyright violation. I know I’ve written about this before, but I finally decided to write a letter to the editor about it. The race for City Council District 7 is heating up with both sides sending numerous printed ads to us, but each side has a different tactic. 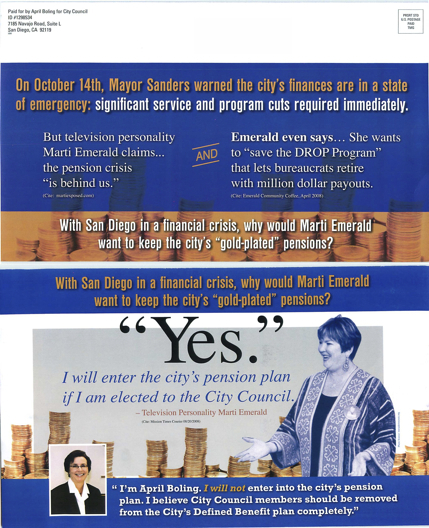 April Boling has decided that negative campaigning is the only way to win the race; instead of focusing on what she can do for San Diego and our council district, she has chosen to show what Marti Emerald hasn’t done. 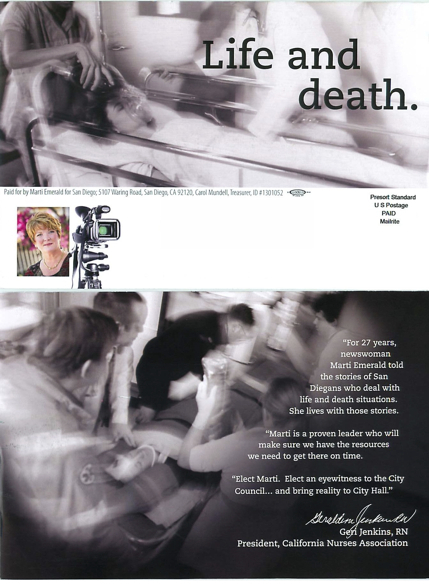 Of course, it hasn’t been Marti’s job to change city council, but April feels it is necessary to blame the city’s problems on her. While I’m disappointed that the Union Tribune has decided to endorse a candidate that has nothing positive to say nor has any real solutions for San Diego, I’m not surprised. I hope that voters in council district 7 don’t simply take the Union Tribune’s word on who should represent this district and can see that we need a city council member that is an outsider and can bring much needed change to our city. Will they publish it? Probably not. Yesterday I received a campaign flyer from Duncan D. Hunter for Congress and started looking at it, not to think that I’d vote for him, but to see why on this earth anyone would elect him. Our local newspaper had an article about our congressional district and how Hunter had a good chance of winning it. What makes him qualified for this position? His father is the current representative for our district and he served in the Marines (he is still in the reserves). Did I list anything else? Nope. In the campaign flyer, he opposed the bailout on Wall Street. While I’m not a huge fan of it, economists understand that something must be done in order to keep the economy from going into more of a recession (without credit, people can’t buy houses, cars, and businesses can’t expand). He, of course, didn’t offer any other suggestion (at least in the flyer) for how to improve the economy (other than to keep military bases open in San Diego). I don’t see the other candidates for this race being any better than him, but he has no credentials to become a U.S. Representative. He surely isn’t going to represent my interests if he gets elected.